We have seen plenty of hairstyle changes throughout the eras – pompadour trends, hipster locks, simplistic crew cuts and many more. Persisting through this modern era is a whole new hairstyle that is so versatile and widely-used that it’s bound to be deemed as the hairstyle of the 21st century. We are talking about a disconnected undercut. 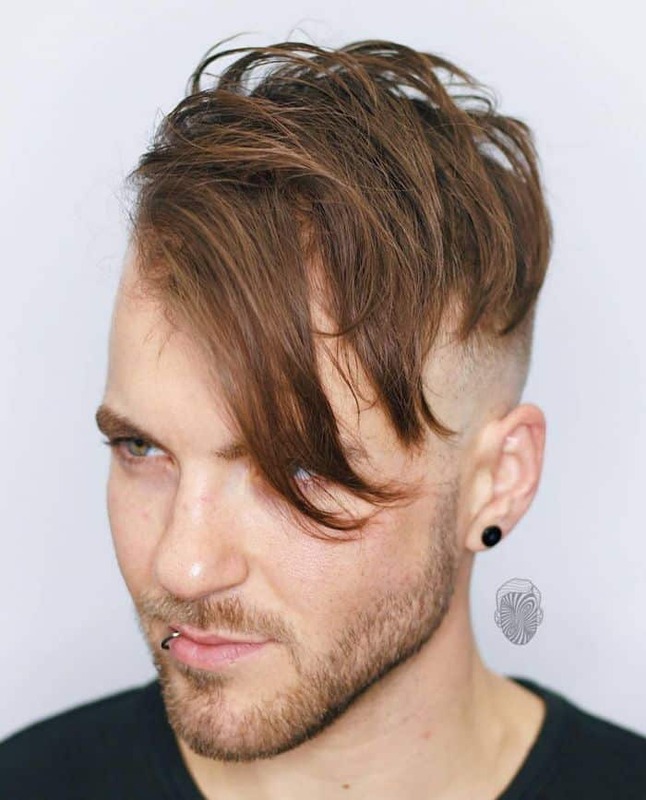 What Is Disconnected Undercut Hairstyle? Let’s break down the term ‘disconnected undercut’ first. An undercut generally refers to a hairstyle that is really short on the back and the sides. The hair on the top is left in a lengthy statement. Usually, you might see a nice blending between the longer top and the short sides, but the term ‘disconnected’ means that there is either little no such blending. You can imagine this hairstyle as a contrasting length for the top and the sides. You can wear your disconnected undercut hairstyle in many different styles. Here are just a few main categories that you can view as a reference and give your own twist too! These disconnected undercut hairstyles are typically seen on celebrities, models and the like. You can expect them to look showy and even extravagant! This style tends to have a more military-style look. Perhaps it’s due to how the hair has to be kept short and neat all the time, unlike how long hair can be kept with a messy look. You will see beautiful boys wearing this style. You will need much more care in maintaining these styles, but the end results are always worth it. The contrast between your long hair and the disconnected sides will be made very obvious with this length. Some people just look a lot better when they have some fringe on. These fringes can be obvious, helping to contrast your look against the shaved sides. Alternatively, your fringe may be short to balance your looks. A disconnected undercut paired with curly hair ends up in only two ways. Either you start rocking a hot rock n roll look, or you add 10 points to your overall gentleness. Among all the disconnected undercut hairstyles, there are a few that are more popular and trendy than the rest. Here are a few that have always been popular among men. Pompadours are one of the most common pairings with disconnected undercuts. This can give you a good illusion of volume when you comb your hair upwards. This sleek look you’re seeing is the embodiment of disconnected undercut’s classic definition – long at the top, sudden contrast right at the sides. There’s some fringe involved here, so you can get yourself a rough idea of how a disconnected undercut might look with some of that up front. The way the hair is combed also contributes to the overall unique textured look. When you brush your hair in an upwards direction rather than sleeked back like most undercut hairstyles, this is how you might appear. It’s quite a cool look! With good hair products, you can achieve this beautiful sleek look. You will need a lot of maintenance to ensure that your hair stays healthy! Soft gel products can temporarily give this look. If your hair is long all around at the lengthy sides, you can create this curved appearance. Highlight the segment in the middle to create a stark contrast! See, it’s not too difficult to look classy. If you have a disconnected undercut, you can show off your new haircut with a classy side-part. When we say, “Short disconnected undercut,” this can be a form of it as well. A line-up paired with hair kept closely-shaved will give you a clean appearance. Charm your ladies with this look! Did you think that all pompadours have to be swept back? This picture proves otherwise! Create this unique look with a hard part along your parting line. Curve your fringe part backwards, and comb the rest to curl towards the center. Mission accomplished! Pair your short disconnected undercut hairstyle with a textured look and a fringe that trails downwards from your scalp. You can try this look if you prefer a casual appearance! Long haircuts can be difficult to maintain and take care of. Prefer shorter hair? Let’s see what you can get! You can have a look that’s like a cropped version of pompadours. You won’t need hair that is too long for this. Enhance the disconnected look with a razor line and comb your hair in one direction! Want to look stylish but don’t have the hair products? Do a simple comb over! All you need is a comb, a little bit of your time and you would get this look. The slightly tousled look will help you to look more casual and natural as well! This is for when you really want to emphasize on the word ‘disconnected’ or contrast in your hairstyle. Your hair will never look like a classic connected undercut if you dye the lengthy ends with such a bright color! Are you into spiky hairstyles? Your short hairdo can do that! If your hair is short enough, you can head out without needing to style your hair much after waking up. At most, you will just need to make sure that your hair parting is still clear. Blond looks good on guys too! Your wavy hairstyle will have a soft, gentle or even fluffy look in this color. It’s alright even if a little bit of your darker hair roots show up. In fact, the darker colors peeking through could enhance your look! If you comb your hair with the correct techniques, you could give your hair a high volume puffy appearance even though that is not the actual case. You won’t need much hair products for this either. Love the uniform short lengths at the back when compared to the slightly longer ends at the top! Even though the hair at the top isn’t that long, it still manages to give off a nice disconnected feel. You will need to fix your hair up with some hair gel or something similar if you are going for this look. This hairstyle is easier to create if you have hair that is uniform in length throughout. The darker hair at the top, shaved sides and light brown beard produces a unique look with 3 different colors. Neat at the top, bushy at the bottom! Well, you can call it a mini-bun too if you’d like. If you have grown out your hair a little, you should be able to tie your hair up a little just like this! We love the addition of a razor line and the line-up for this look as well. Prefer the charming looks associated with longer hair? We get it. Here are some long disconnected undercut looks that you are bound to love! If you’ve got slightly curly hair, you can use this to your advantage! Create long, wavy curls at the top and shave your sides. This will result in an attention-grabbing long & wavy look. When you do a comb-over with long hair and an undercut, you get this look. The contrast in length on both sides create an alluring appearance that you can’t resist! Light blond color goes extremely well with side-swept long hair in a disconnected undercut hairstyle. If you have tried this hairstyle out with other hair colors, do show us! With longer hair, you can curve your hair higher and bigger to create a super high volume appearance. Short hair would not be able to create the same effect as easily. Look at how the beard complements the disconnected look for this swept-back style! You might need hair that’s a little thicker to sport this look better. Create a faux hawk look with your long hair. Pair it with shortcut sides for a nice disconnected look! To get this look, you will need to direct your hair upwards rather than a sweep-back as usual. Are you a fan of really, really long hair? You can still create a disconnected undercut look with that length! As long as the sides are cut really short, you can do it! If a fashionista look is what you’re going for,you can style your long hair this way. We like to call this the “messy hair, don’t care” hairstyle, and it’s easy to see why! With enough hair product, you can create a nice textured look. Comb your hair backwards ala pompadour style, and gel it up to create more textures! Alright, we take back the ‘messy’ hairstyle listed at number 8. This is the true messy style for long hair. It still looks really good with some stubbles for a beard regardless! Disconnected undercuts can look awesome if you were to keep it with a fringe as well. Here are several styles that you can rock with a fringe. Well, to be fair, no one said that fringes need to be neat. So, this is one way that you can style your disconnected undercut with a messed-up fringe. Let us know how it turns out! If you’re looking for something unique, feel free to go for this style! This disconnected undercut also features some razor line designs on it. The lengthy fringe hangs all towards one side only, thus the asymmetrical term in the name. Does this look like a style typically used by music bands? The contrast obvious in disconnected undercut hairstyles is enhanced with a bald fade at the sides in this look. You can create a spiked fringe look if your fringe is exceptionally long. In a way, this looks like an imitation of a mohawk style! If you’d like, you can create a short-fringed wavy look for a neat and styled look. Your disconnected undercut look does not need to be too exaggerated for it to look good! Want to mix your disconnected undercut with another unique style? Pair it with a line-up and a hard part to distinguish the lengthy parts and your shaved sides! If you have thick, slightly curly hair, you can product a textured look with just your fringe to give yourself a stylized disconnected undercut hairstyle. We bet you haven’t seen this unique hairstyle much on the street! Be an attention-grabber with this curled up fringe and a good disconnected undercut! We can’t guarantee that a bowl cut will look good on you, but you can be sure that this twist will! Keep your hair short with just a hint of a fringe, and shave off the sides to get this look. If you like to keep it simple, this hairstyle is for yours! When you cut your fringe to a uniform length and keep the sides equally short, you will be able to get yourself a neatly-shaved disconnected undercut. If anyone told you that disconnected undercuts will not look good with curly hair, they have no idea what they are talking about. Long curls look good regardless of the hairstyle that you are using! This is one of the best examples that we can provide. Paired with the contrasting shaved sides, you can be sure that you are attracting the positive type of attention! Let your tight curls drop like a grapevine from your fringe! We love how the razor line brings out a nice contrast with the line-up for this style. Perhaps you’d prefer your hair to be curled only at the fringe parts? That’s doable too! You can pair your curly hair with a bushy beard and it’d still look just as good. This is relatively low-maintenance as compared to some other haircuts. You can keep your curls short at the top and shave off the rest! Let your curls run wild, but keep your disconnected undercuts in shape with some light stubbles. The uniformity in the undercut’s length makes the haircut look good! Light brown color fits well for a curly or wavy disconnected undercut too! Usually, you will be able to get a naturally wavy texture if you have curly hair. You can put the spotlight on your curly hair by directing the curls towards your fringe. With a mid-length fringe, it’s quite easy to maintain and you’d look good, so why not? If you are not sure how you can start styling your curls, you can consider styling them as part of longer bangs. This is one of the more natural hairstyles that you can start rocking! Some neat stubbles can never go wrong when you are getting a disconnected undercut. As long as you have a neat line-up even for your stubbles, you’re all good! Here’s to the artsy people who likes to be a little more on the edgy side. You can embed some patterns in your undercut and rock your textured curls! How to Get a Disconnected Undercut? You will first need to grow your hair to about 2-inches long to get the contrasting disconnected look between your lengthy top and the shaved sides. Only the sides need to be cut – usually, the top is just left as it is or swept backwards without any cutting involved. Usually, the sides are cut with a pair of clippers, and you will need a clipper #1 to touch up your hair’s edges at your neckline. How to Style Your Disconnected Undercut? Your disconnected undercut features long hair at the top, remember? You can utilize this to style your haircut! There are several common styling choices that you can do from home. For a sleek and neat look, part your hair to one side to make it a comb-over, or sweep it backward. Prioritizing volume? Use a hairdryer after showering and blow your hair backward to give an illusion of volume! If your hair is really lengthy at the top, you can also tie it up in a bun to give yourself a slight hipster look! This will look great if you have a beard as well. How to Maintain Your Disconnected Undercut? Seeing as the main element in a disconnected undercut is the contrast between your lengthy hair at the top and the short sides, you will need to maintain your hairstyle regularly so that the contrast is noticeable. The only difference between these two hairstyles is the presence or absence of blending between your hair at the top and the short sides. An undercut (otherwise known as a connected haircut) will feature a smooth blending, but a disconnected hairstyle will show a highly-contrasting length difference. 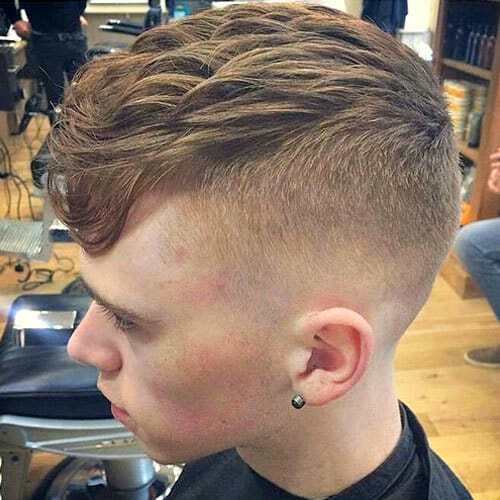 You can consider fade as an element of a connected hairstyle. The gradual fade of your hair at the sides as your hair goes from medium-short to short or completely shaved is called a fade. Disconnected hairstyles usually feature very little fade if at all. If you are looking for a next haircut that you can go for, you can try getting a disconnected haircut! This is a good hairstyle choice that is adopted often due to its versatility. If you find a picture here for which the style you like, you can use the pictures for your hairstylist to refer to!